Fourth Premier of the People's Republic of China, between 1987 and 1998, and the Chairman of the Standing Committee of the National People's Congress, China's top legislative body, from 1998 to 2003. Signed portrait photograph. n.p.n.d. 240 : 175 mm. 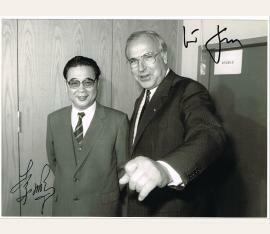 Official German press photograph of the Chinese politician Li Peng 李鹏	together with German Chancellor Helmut Kohl. Signed by both recto. - As Premier, Li was the most visible representative of China's government who backed the use of force to quell the Tiananmen Square protests of 1989. During the Tiananmen protests of 1989, Li used his authority as Premier to declare martial law, and in cooperation with Deng Xiaoping, who was the Chairman of the Central Military Commission, to order the June 1989 military crackdown against student pro-democracy demonstrators in Tiananmen Square, Beijing. 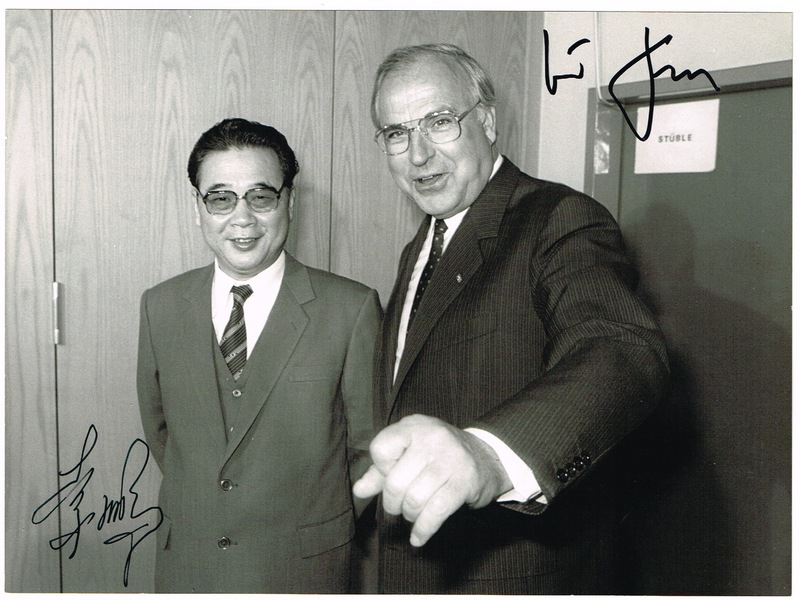 Li also advocated for a largely conservative approach with Chinese economic reform, which placed him at odds with General Secretary Zhao Ziyang, who fell out of favour after 1989. As Premier, Li oversaw a rapidly growing economy, and attempted to decentralize and downsize the Chinese bureaucracy, to varying degrees of success. He was at the helm of the controversial Three Gorges Dam project..